Noah meets Avery at a Halloween party and falls in love but gets friend-zoned. 3 years later she's engaged to someone else. Noah uses the photo booth time machine several times to return and fix things. Will it work or...? Which 'First' Titled Movie Is First? Two corporate executive assistants hatch a plan to match-make their two bosses. A high school student is forced to confront her secret crush at a kissing booth. A teenage girl's secret love letters are exposed and wreak havoc on her love life. A high school senior instigates a social pecking order revolution after finding out that she has been labeled the DUFF - Designated Ugly Fat Friend - by her prettier, more popular counterparts. A shy senior and a down-to-earth junior fall in love over one weekend. Nervous about finally getting married, a guy is forced to relive the same nerve-wracking hours over and over again until he gets things right on his wedding day. A Chicago baker (V.Hudgens) is competing in a Christmas baking competition in Belgravia. There she bumps into the prince's fiancee. They look alike and switch for 2 days. "Life is what happens to you while you're busy making other plans." Noah thinks he has the perfect first night with Avery, the girl of his dreams, but gets relegated to the friend zone. He spends the next three years wondering what went wrong - until he gets the unexpected chance to travel back in time and change that night - and his fate - over and over again. All he needs is a second chance to be her first choice. Noah Ashby: Don't fall in love! She's gonna rip your heart out! Like most movies, has it's positives and negatives. 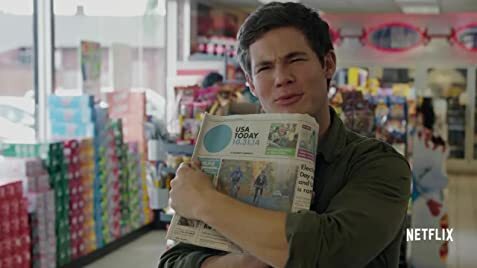 A romantic comedy about a guy who travels back in time, multiple times, in an attempt to get out of the 'friend zone' with the girl of his dreams. 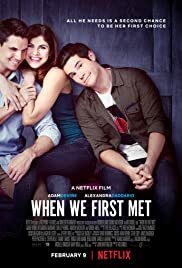 It stars Adam Devine, Alexandra Daddario, Shelley Hennig, Robbie Amell and Andrew Bachelor. It was directed by Ari Sandel (who also helmed 2015's 'THE DUFF'), and it was written by Devine and John Whittington (who also co-wrote 'THE LEGO BATMAN MOVIE' and 'THE LEGO NINJAGO MOVIE'). The film was released by Netflix through it's streaming site. I found it to be mildly amusing. Noah Ashby (Devine) has been hopelessly in love with his best friend Avery Martin (Daddario), ever since the night they met. He felt that night went perfect, but she has kept him in the 'friend zone' ever since (and now she's engaged to someone else). Upon making a wish in a picture booth, to make things different, Noah travels back in time to the night he met Avery. When he doesn't set things right the first time, he keeps traveling back in time (to the same night) in a desperate attempt to get it right. The movie has a cool premise, and it's kind of a unique new twist on the time traveling flick, but other than that it's kind of simple and unoriginal. Devine is good in it though, and he's always funny in my opinion. Daddario's character is pretty unlikable though, in my opinion as well, and I had a hard time even relating to why he's so in love with her. It's also pretty obvious, the entire film, who he should be pining after. The film, like most movies, has it's positives and negatives, and I'll give it a slightly above average rating for them. 6 of 11 people found this review helpful. Was this review helpful to you?